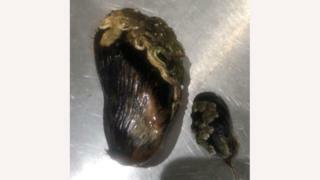 A chef has been delighted to find a clappy-doo, a horse mussel that has grown larger than a regular sized shellfish. Also known as a clabby-doo, it was found by Calum Montgomery in Loch Ainort at Luib in Skye. The name is derived from the Gaelic words "clab" meaning an enormous mouth and "dubh" which means black or dark, according to the Scots Language Centre. Mr Montgomery said the clappy-doo was about 15cm (6in) in length. Mr Montgomery, chef patron of Skye's Edinbane Lodge, said: "My family have been telling me about them for years. "This is the first live one I have found." Loch Fyne in Argyll used to be known for its clappy-doos. Mr Montgomery said he planned on having his mussel along with some surf clams for his tea on Tuesday.